General Mills Curvy Straws Giveaway! Though I've been under the weather for nearly 2 weeks, it's time for another giveaway! 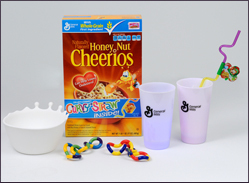 This time, General Mills is introducing some breakfast time fun for the kids and it's a great way to make sure the finish all their milk in their cereal bowl. They're called Curvy Straws and my son has been opting for a bowl of cereal just to use his! Plus, you can for $1.25 off 2 boxes! Make sure you leave a comment for each action you take. Contest ends on Sunday April 29th at 11:59pm. Winner will be chosen some time after.